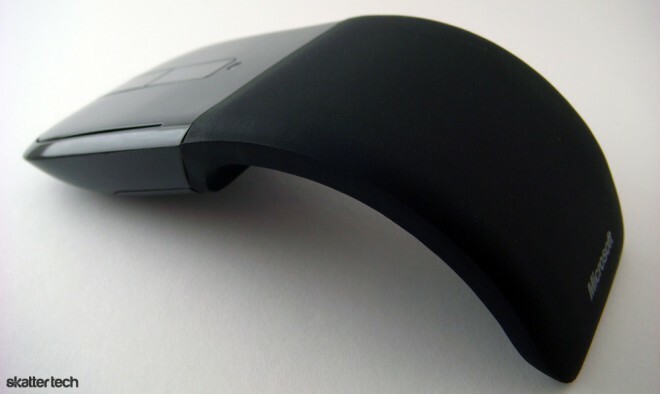 About a year ago, we reviewed the Microsoft Arc Mouse which sported a unique curved design and a compact form factor. Towards the end of last year, Microsoft announced a newer Arc Touch Mouse, an upgrade to the last generation model with a hint of touch. Like most of the company’s new mice, it sports the BlueTrack technology which enables use on many less than optimal surfaces. Getting started with the Arc Touch Mouse is quite easy. A tiny transceiver, which magnetically adheres to the bottom of the mouse, plugs into a free USB port and Windows 7 takes care of the rest. Within a minute, your new mouse will be ready to go without too much hassle. Although you may choose to install software for additional customization, all the basic features and functions work out of the box. 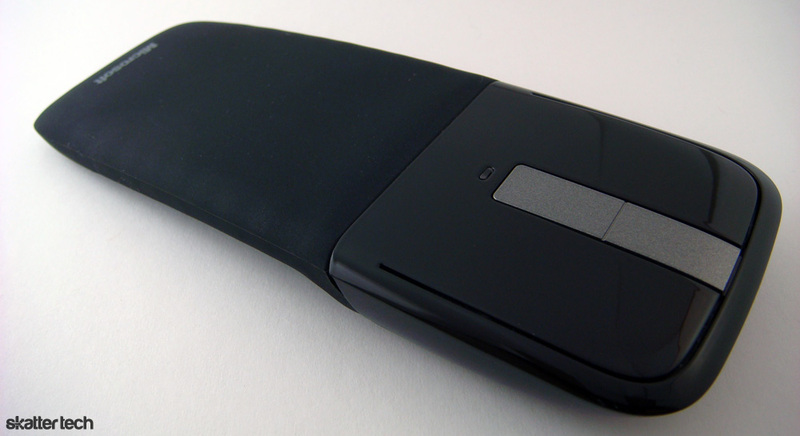 The Arc Touch Mouse runs on two included AAA batteries which stow up in front. Snapping the mouse into a curved shape from the original flat form factor switches the device on and a blue LED confirms it. There are buttons for left and right-click along with a touch strip for scrolling and middle click. The mouse notably lacks a back and forward button, which is quite helpful for browsing the web. When it comes to travel mice, the Logitech Anywhere MX was a favorite. Surprisingly, the Arc Touch Mouse is even more compact. Although it does not come with a case or sleeve, the slim design flattens out for easy packing without having to deal with any odd bulges. Microsoft’s excellent minimalistic design makes the mouse stands out from other offerings. Despite the flexible body, the mouse is actually quite robust and the lower smooth matte rubberized texture is durable. Unfortunately, I can not say the same for the rest of the mouse: there are numerous flaws. The upper portion of the mouse features a glossy plastic finish which is a fingerprint magnet. Every bit of dirt, dust, and grime are visible. The mouse requires regular maintenance for an uptight look. I also found that the left and right-click buttons require reaching towards the front end and the recessed style does not help either. Clicking also requires too much force leading to productivity slow down. I also was not happy about the unusually small teflon pads which do not allow for enough frictionless movement. Even on a smooth surface, movement feels somewhat rough. When the mouse first arrived, I assumed it was an entirely touch-based product with no physical buttons. Unfortunately, only a small silver strip is touch enabled with a haptic vibrating motor for feedback. Sliding your finger from top to bottom or vice versa allows for notched scrolling. It also supports quick flicks and awkwardly double tapping initiates a less than efficient middle click. A quick tap towards the very top or bottom equals a page up or page down click, respectively. On the other hand, The BlueTrack sensor was impressive as always. While it doesn’t work on glass surfaces like Logitech’s Darkfield technology, it worked perfectly on a cloth mouse pad, a wooden surface, granite, carpet, and glossy magazines. I found pin point accuracy, enough sensitivity, and the mouse worked smoothly from as far as 30 feet away. Although I do not have the time to put this one aspect to the test, Microsoft claims around 6 months of battery life. If you were waiting for a Microsoft version of the innovative Apple Magic Mouse, this probably is not right for you. 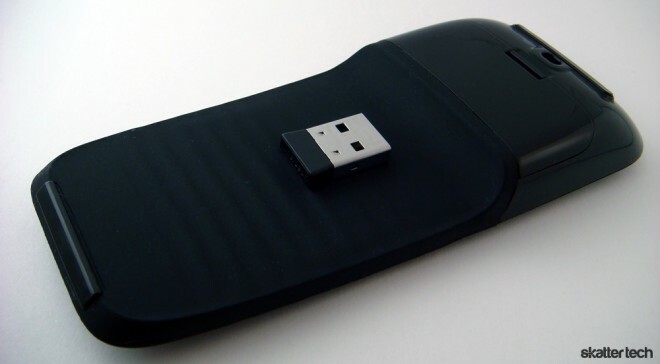 However, the Arc Touch Mouse does make an excellent travel mouse with a streamlined design and a unique touch sensitive scroll pad. I was particularly turned off by the lack of back and forward buttons, but it is not a problem if you do not use them. While I think the left and right-click keys could use some improvements in a future iteration, the mouse is reliable and works on just about any surface. The fool-proof easy setup process is also a major plus for those that are not too tech savvy. For those looking to buy, it’s available for as little as $50 if you shop around.